Little Bird #1 is out 3/13/2019. 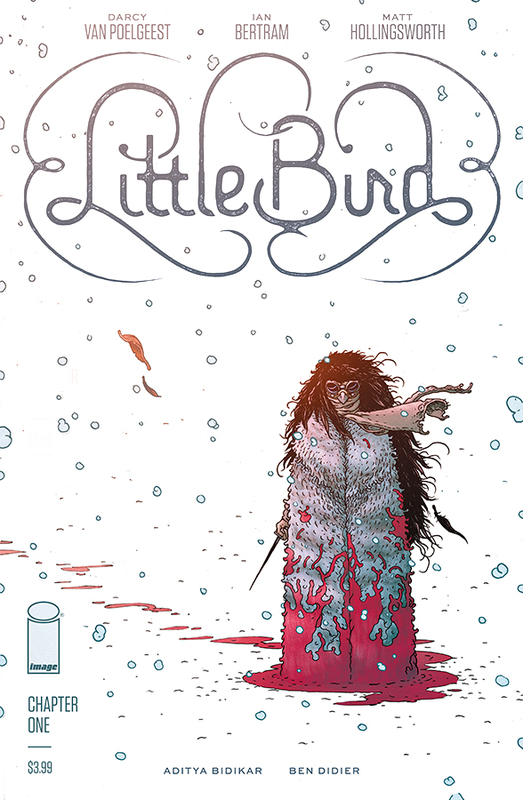 By Zack Quaintance — Little Bird #1 is one hell of a debut comic, a likely contender best #1 comic of the year. I know we’re only halfway through the second month, but is so good that I’m confident in saying that. Little Bird #1 is the type of immersive story you pick up, blink, and realize you’ve read the whole thing without stopping, without even considering putting it down. So yes, it’s very good, and I highly recommend comics fans read it. I could stop there, but (obviously) the lot of the comics reviewer is such that I’m here to also explain why. With Little Bird, it’s fitting to start with a discussion of the art. Ian Bertram’s phenomenal linework and sequential storytelling is the first thing that grabs reader attention, as well as the biggest factor in why the story feels so immersive. A big question I had by the end of it was who the hell is Ian Bertram and why have I not yet heard of him? Well, mostly because Bertram has done a handful of superhero stories, some webcomics, and, perhaps most recently, a six-issue 2016 miniseries for Dark Horse Comics called House of Penance written by Peter Tomasi about the Winchester House in Northern California (which I obviously missed). He’s not a total unknown, but he’s far from a major name comics. I predict that will change once Little Bird finds the audience it deserves. Bertram’s work here is incredible, as singular as it is gorgeous. His linework is the wavy, detailed style I associate with Frank Quitely (and others who came after him, like Jon Davis-Hunt or Ramon Villalobos), and his designs for everything from characters to clothing to genetically-enhanced bodies to the fiery floating nun woman (you read that right) to buildings—I could continue but I’ll stop and note everything is rendered with an ideal balance of intricacy and imagination. There are touches here of Moebius and Jodorowsky, of Terry Gilliam’s Brazil, Fiona Staple’s designs in Saga, the overblown carnage of that one big fight scene in Kill Bill, and the list goes on. Bertram’s keen visuals coalesce to create something all its own, augmented and made possible by the vital rhythm section of Matt Hollingsworth’s colors and Aditya Bidikar’s lettering. All three deserve much credit. Darcy Van Poelgeest—a first-time comic book writer with a background in film—gives the top-tier art much to work with via his scripting. I was particularly impressed with how compressed and dense Van Poelgeest’s story felt. Often times for creators from other mediums—especially film—there is a tendency to decompress comics, as one might a storyboard. Van Poelgeest, however, packs more into his first three pages than some new creators would an entire opening arc, immediately justifying why comics are being use to tell this story. The first line is poetic, the first pages rich with expository details that don’t feel forced. The child character (the titular Little Bird) is an automatic means of engendering sympathy, while a militaristic speech clues us in to the world’s high stakes. This is an advanced review, though, so I’m hesitant to get more specific. I’ll just say that the level of world-building and imagination on display is strong, conveying grandiose vision while using the main character as an anchor to keep readers from drifting into disorientation. There are ample twists and many unpredictable reveals. If I have a small qualm, it’s that I think the full story needs to justify the gruesome violence that occurs here (there are hints it will but we still need to wait to see if the story delivers). Also, I know this is silly, but I’m salty about it only spanning five issues. I know I know, and I appreciate creators who have a specific vision...but hey, maybe Little Bird will be such a success that it will get expanded, rendering its first lineprophetic, This doesn’t end here. Not like this.